With all the different plugs and voltages out there in the world, one of the must-haves in your packing list is a single adapter that supports a diverse range of voltages, electrical systems and physical plug configurations. Especially, voltages. Most of the gadgets made in the United States and Canada requires a 110v connection to operate. Meanwhile, the rest of the world works differently. Japan, parts of South America and the Caribbean have power systems that use between 100 volts and 125 volts. The bulk of Europe operates at 220 volts. On the African continent and in large parts of India, there is no standardization. The electrical current used in one region may not be the same as that used in the next. In sprawling populations, the number of volts flowing out of the wall can even differ from street to street. A lot of modern laptops, electric razors and smartphones come with power adapters that have voltage converters inbuilt. And with other hardware, hair dryers or electric toothbrushes, for example, you might not be so lucky. For all of these reasons, if you plan on spending anytime abroad, you’ll want to invest in a travel adapter and electrical converter. The lightweight, small and cheap Conair Travel Smart Adapter Combo provides everything you need in an international power converter. This device works in most of the countries and protects your gadgets against power surges. It offers four different plug configurations, that’ll allow you to plug it into the wall in over 150 different countries. It can run in two different modes: adapter only and adapter/convert, making it possible power your 110/120v volt hardware, even if the current coming out of the wall is 220/240v. Better still, the Conair also boasts a built-in surge protector which is a great feature to have for anyone visiting countries where power surges are common. Most importantly, weighing in at only seven ounces and 4.2 x 2.5 x 6.2 inches, it’s small and light. 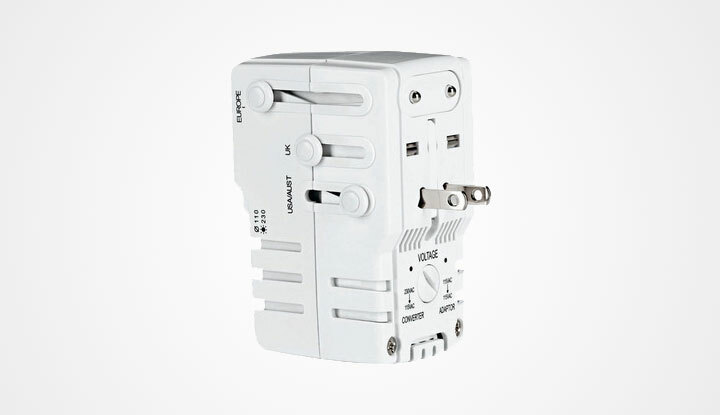 There are a lot of differelt adapters out there and one of them is Kensington’s International Travel Plug Adapter which is $16 and provides compatibility in over 150 countries and surge protection. But it doesn’t have a voltage converter built into it. Another one on the list is Eagle Creek Dual Wattage International Converter Set at $45, come with 5 interchangeable adapter heads that can be plugged into a power converter. But it’s twice the price of the Conair and offers no additional benefits. If you’re traveling internationally, Conair Travel Smart Adapter Combo is the one you want to get.